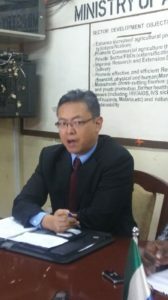 Deputy Country Representative of the World Food Programme (WFP), Yasuhiro Tsumura has observed that chronic malnutrition remains as high as 31 percent in Sierra Leone. He revealed, however, that they would ensure all other interventions are nutrition-sensitive, contributing to better nutrition regime and behaviour in target households. Yasuhiro Tsumura made the statement during World Food Day celebration in Moyamba, Southern Sierra Leone. “WFP also continues to work with the Government, UNICEF and other partners to prevent stunting (or chronic malnutrition) which still remains a great issue- by providing a nutrient rich complementary food, to children 6-23 months. We are further intensifying our collaboration with the Government and the partners to promote skill transfers and behaviour changes in target communities and households,’’ he said. Mr Tsumura said this year marked the 70th anniversary since the establishment of WFP’s parent organisation, Food and Agricultural Organization (FAO), founded in 1945, and that it also marked 40 years of their presence in Sierra Leone. He congratulated FAO on its anniversary and renewed his organisation’s willingness to strengthen partnership between the Rome-based UN organisations fighting against hunger. The WFP Deputy Country Representative said they have been operating in Sierra Leone for several decades and that throughout the period they have provided support to the people and Government of Sierra Leone in the area of food security and nutrition, through assistance to displaced people and refugees, victims of Ebola and mudslides communities, as well as local and national government structures to contribute to a more self-sufficient and sustainable food security. “At certain point, WFP provided food assistance to almost 2 million people in the country. Today, the people and the Government of Sierra Leone are standing at a very important turning point, where they are getting out of a long crisis and recovery period towards a steady and accelerated development journey,” he disclosed. He expressed that they were honoured to witness the transition and accompanying Sierra Leone in the journey by continuing to help the country achieve Zero Hunger, stressing that while WFP was always ready to quickly respond to an emergency such as the Ebola outbreak and last year’s mudslide, they have been gradually shifting their focus from direct assistance towards capacity strengthening of vulnerable households, supporting the ‘economic transformation’ of Sierra Leone through the development of more sustainable food systems. The WFP deputy boss highlighted that recognising Sierra Leone’s true agricultural potential through the realisation and empowerment of human capital would be essential in achieving broad-based economic growth, reducing dependency on imports and the creation of an enabling environment for future investment. “Self-reliance is a tangible reality- we just need to work together to achieve it. There are so many abundant drivers of transformation in the country. Family farmers are the dominant forces in food production with rural women as the engines behind such production. When we support rural women with the skills, education and capacity to be self-reliant, we can make history and come closer to achieving zero hunger. Realising their untapped potential is increasingly becoming of WFP’s interest, with our support to rural female farmers extending not just to simple producers but also supporting women’s capacity in processing and value addition,” he noted. He said WFP has contributed towards better organisation, management and social cohesion of farming groups where women’s representation is high, stating that last year they supported 42 farmer-based organisations and Agricultural Business Centres across the country, providing training on crop assessment, crop handling and post-harvesting training. “In total, 11,000 farmers were reached and 55 percent of them were women,” he said. He further disclosed that WFP recently resumed its support to the Government’s national school feeding programme which is an indispensable pillar of the Free Quality Education initiative. He added that they were very proud to be trusted to further help the government reach up to more than 400,000 children with nutritious meals in all districts across Sierra Leone during the school year. “Our Actions are Our Future; a Zero Hunger World is possible by 2030. Yes, a Zero Hunger in Sierra Leone is possible by 2030. It is possible if all of us present here unite our efforts. We are supporting the National Zero Hunger Strategic Review which is a national and inclusive process involving all actors in the country to reflect on the problems and gaps in achievement Zero Hunger by 2030,” he said.